The Sally Hansen nail strips, and just cool/designed nails in general are becoming uber popular right now. I'm not gonna lie, I love the trend! ....But I don't know how I feel about the same trend carrying over to lips. 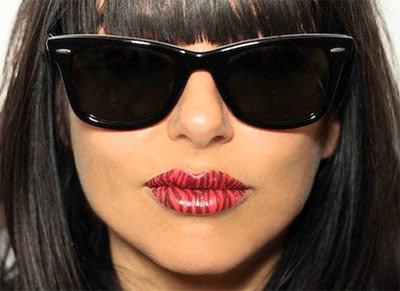 "Violent Lips" are temporary tattoos [yes, the same things you loved putting all over your body as a kid] with animal print, glitter, and other designs on them. All of these would look awesome on your nails... but your lips?! At least those are somewhat normal with a little flare, and actually, I'd love to give them a whirl. I watched the tutorials and they seem a little iffy, but it probably depends on lip shape. Chances of them working on my barely there, crooked lips- slim to none, I bet. And if any of you have ever tried them, let me know! I really want to see these in real life, without a pro. Color me intrigued, for sure.